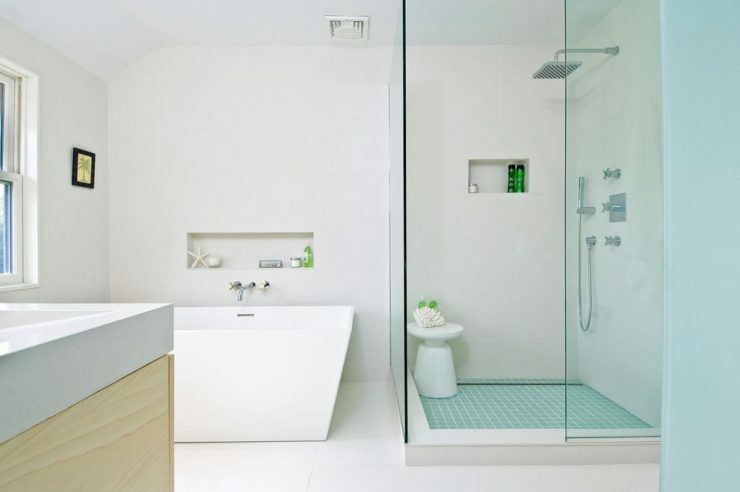 To help you kickstart the quest to finding your perfect shower floor, we have connected the best materials, styles and patterns to use as inspiration for your bathroom. 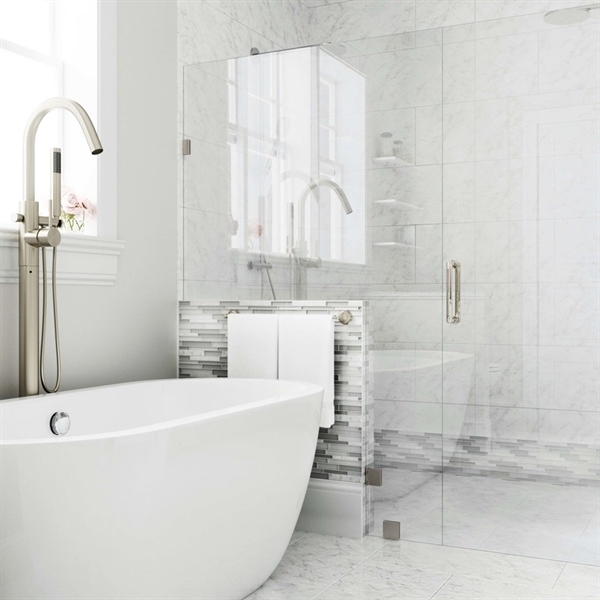 When thinking about bathrooms, and bath floor designs in particular, one of the things furthest from the forefront of your mind is your shower stall most likely. Which is a grave oversight, and can easily lead to a whole wealth of missed (design) opportunities. Typically, when thinking about fitting a new shower into your bathroom, you’re concerned with the actual type of shower you prefer, which fixtures you like, whether or not you need additional shelves, and -possibly- lighting. 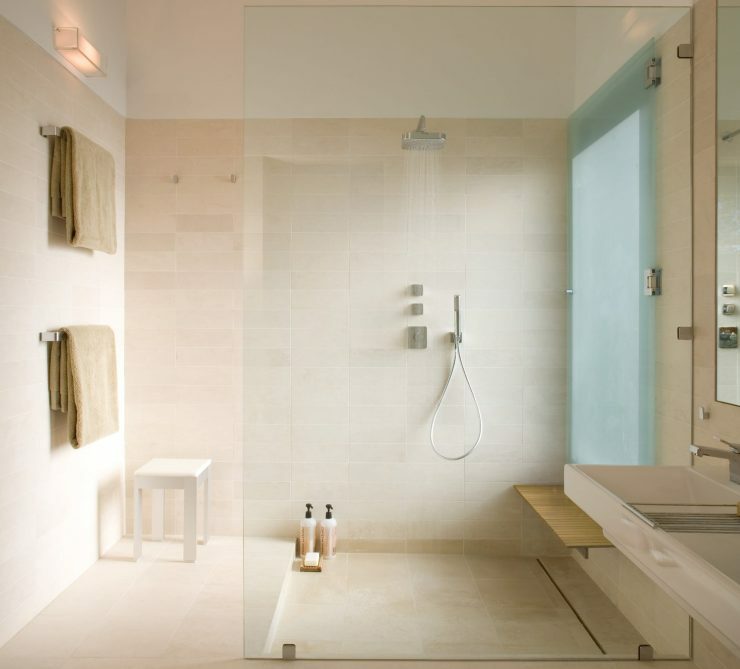 What you should be taking in account the most, however, is the actual design of your shower’s floor. 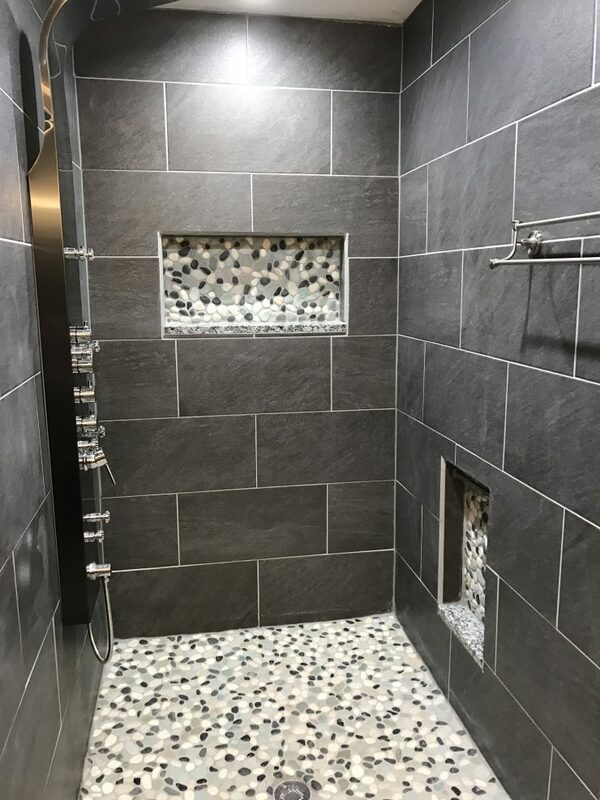 Not only is picking the right shower floor a great place to start from when building the design of the whole room around it, it also is a matter of comfort and personal preference in one of the most-often used places in your home. Showers, by their very nature, should be places of relaxation and (quiet) luxury. Places that make you feel calm and help you get rid of the strain of your day. And having a solid, tasteful, inviting floor that grounds you and invites you to stay and enjoy the warm and soothing water that little bit longer, is the best place to start creating your perfect oasis. 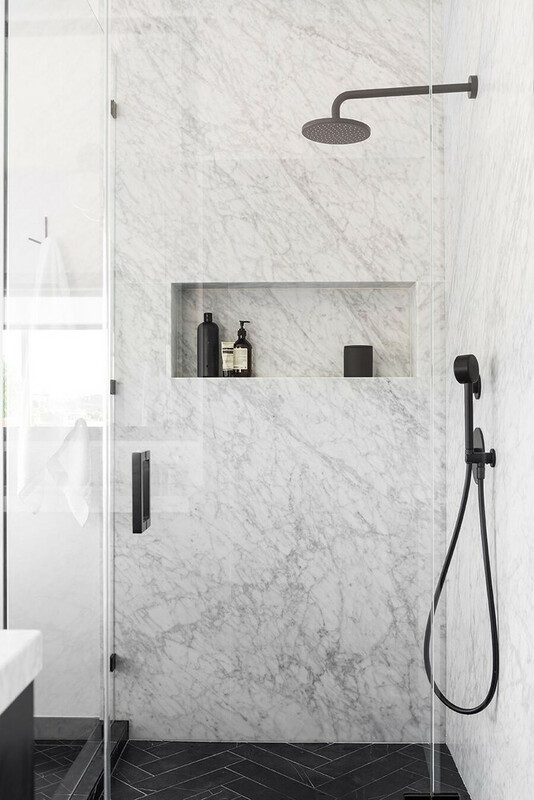 Marble, with its very distinct look, is the perfect choice for bathrooms, and -by extension- your shower floor. Even in its darker variants, marble manages to infuse a room with luxurious comfort, and thus serves incredibly well to create a homy, relaxing atmosphere while still giving the room an understated look of pure elegance. 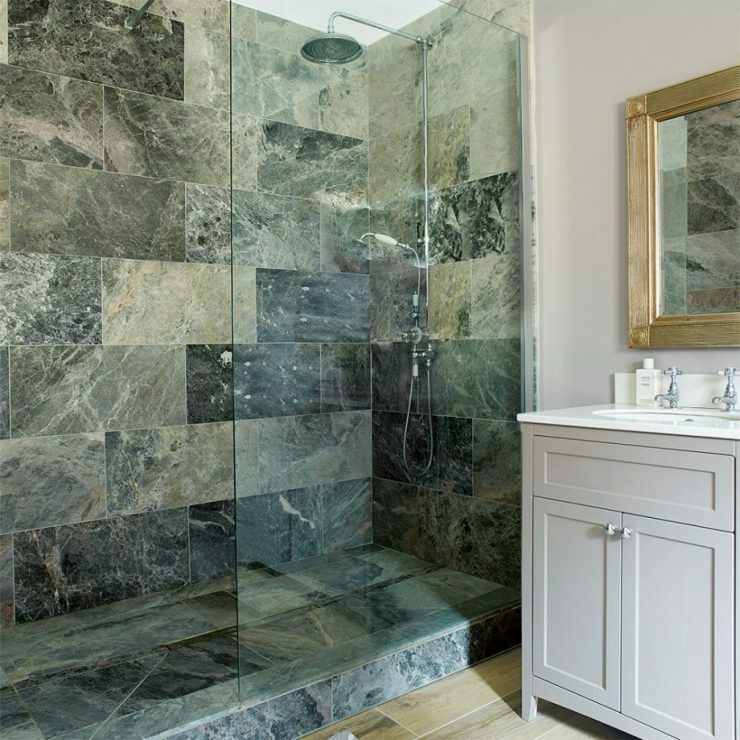 Marble shower floors can be perfectly matched with about any other type of bathroom flooring, and works surprisingly well in combination with warm woods. The biggest advantage of limestone is the very simple fact that it adds warmth to whatever room it is used in. 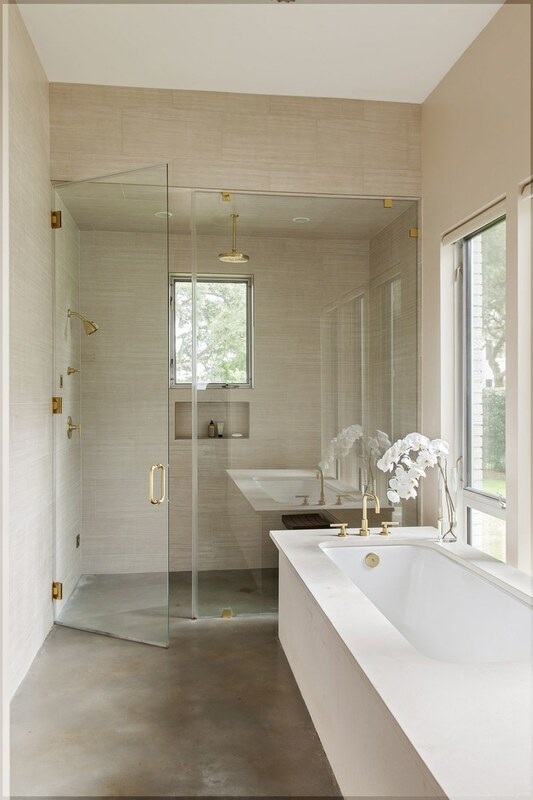 Outfitting a bathroom with limestone flooring, and possibly even wall tiles, is a sure-fire way to create a welcoming atmosphere even in the darkest spaces. And if you’re happy with the way your bathroom design is, you can easily add a touch of additional warmth with a limestone shower floor. And even in smaller bathrooms, a slab of limestone does wonders as flooring in your shower-stall without needing to invest in big renovations. Adding wood to a shower seems pretty much unintuitive, and even impractical, at first glance. However, wood, and in particular cedar does withstand water and humidity very well, and there’s hardly any better feeling than stepping on to warm, forgiving wood rather than cold tiles first thing in the morning. Cedar, with its natural, warm look easily transforms your shower stall into an oasis of relaxation, not unlike the atmosphere generally found in good spas. Additionally, cedar shower floors are an incredibly easy and inexpensive DIY project if you just want to enhance your bathroom design without investing in a full remodelling project. Basically, you can fashion a cedar grid that goes on top of your already existing shower tray or flooring, and transform your shower in just a few easy steps. Pebbles are a great way to add individuality to your bathroom. The great thing about using pebbles as your shower floor is that they come in a near endless variety of shapes, colours, and sizes. Whether you want to go for a warm, light look, accent your dark tiles with a lighter floor that picks up on the rooms colour-scheme, create an elegant dark shower floor, or want to enjoy a multitude of colours in your bathroom, you will find the right pebbles to make your vision reality. Additionally, pebbles allow you to not stop with your shower-floor, either. Quite contrary, actually, pebbles are perfectly suited to go all out creative with your design! We have seen “stacks” of pebbles seemingly sliding down the shower wall to “pool” on the floor, we have seen elaborate designs of curves spiralling out from the shower spanning the whole bathroom floor, the opportunities are endless! The natural raisin of teak causes this wood to become more flexible and bend when in contact with water, thus making it the perfect choice for shower floors. Just as cedar floors, a teak base in your walk-in shower or shower stall creates instant warmth and gives your bathroom a spa-like quality that promotes comfort and relaxation. The first words that come to mind when thinking about showers and porcelain are “traditional”, “boring”, and “usual”. While that, in part, might be true, porcelain doesn’t have to be the traditional, slightly boring white on white we tend to envision. These days, porcelain tiles come in a stunning variety of different styles and textures that allow you to find the perfect fit for your new bathroom without having to divert from the true and tested quality of porcelain tiles. Among others, contemporary porcelain finishes include authentic wood, stone, or (as pictured above) marble designs. Keep in mind, though, that porcelain tends to be more slippery than other options. This might influence your decision of which flooring to pick, particularly if your shower is used by children, injured, or elderly persons. At first glance having a concrete shower floor might sound like you’re settling for a (partly) unfinished bathroom. That, however, couldn’t be farther from the truth. While a concrete floor definitely underscores a plain, bare look, this inherent understatement works incredibly well with either very reduced, modern designs or as counterpoint to elaborate, vibrant, maybe colourful bathrooms. One of the absolute pluses of concrete flooring is that it is incredibly durable and doesn’t need much in terms of upkeep. Once you have laid the floor, all of the work is done – and who doesn’t like seeing their cleaning-time cut short? 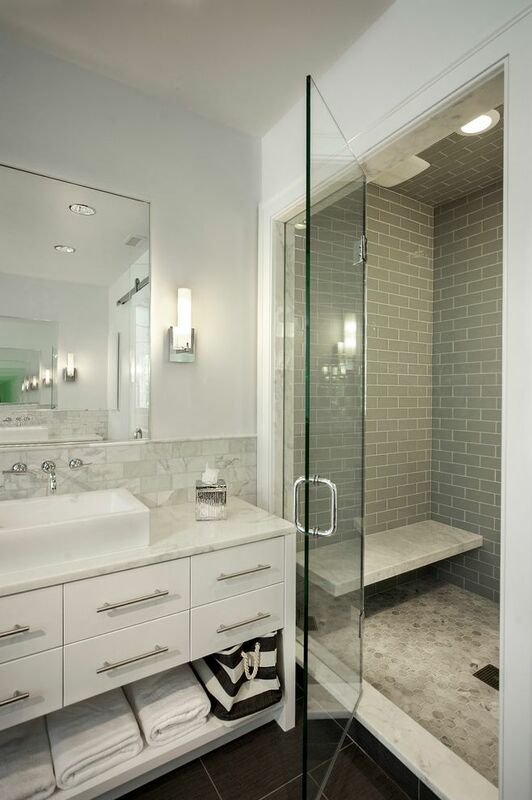 Glass panels as shower walls are the most common option for both walk-in showers and shower stalls. Using the same material as a shower floor option is way less common. The reason for that, however, is beyond us, since glass (tiles) used as flooring give a unique clean, contemporary look that isn’t easy to imitate. These days, shower trays come in various unique shapes or as platforms and have lost all of their slightly outdated square look. 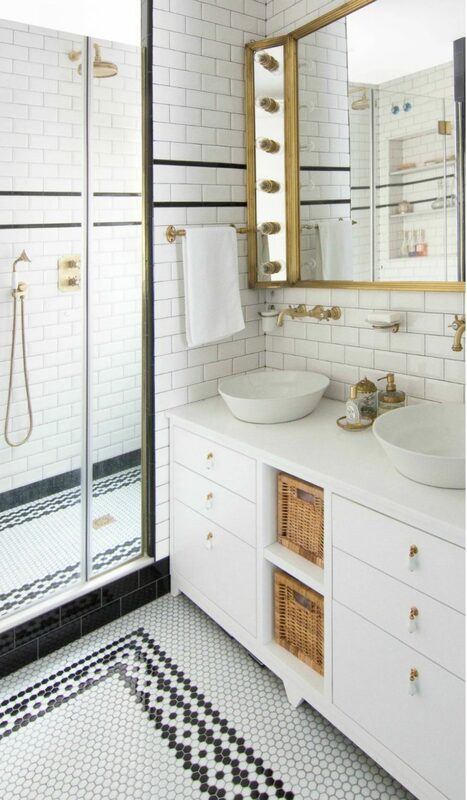 Penny tiles are a lovely way to create surprising shower floors that are as unique as you yourself. Penny tiles come in a variety of sizes and can be used in multiple ways. 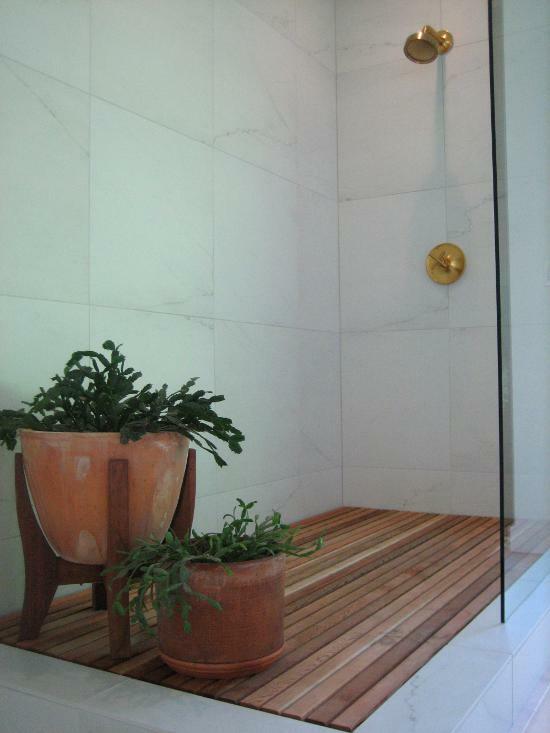 If you go for smallish, multi-coloured tiles as in our example picture above, you can create a subdued, natural-looking flooring that reminds of a pebble- or soil-bottomed outdoor shower. If you go for larger penny tiles in monochromes, you can create stunning patterns that make your shower appear larger than it actually is. Patterned tiles are at the same time incredibly trendy and very traditional. These kind of tiles have been around for a long time, and for a good reason. Patterned tiles add depth to any room, and easily create an illusion of space by drawing the eye to the repeated patterns. 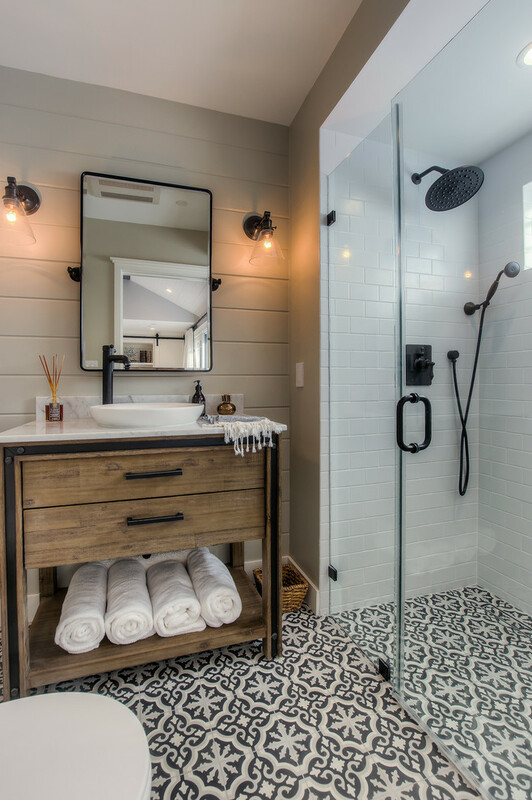 Whether you chose to go all in and tile your whole bathroom, or elect to use them as a focal point just on your shower floor, patterned tiles are a great fit for rooms of any size. Hexagon tiles are a tried and tested staple of bathroom design, and have a variety of perks that speak strongly for them. Not only do hexagon tiles always look great, they give off a warmer, more friendly vibe than plain (porcelain) tiles and/or shower trays when a uniform white or beige is used throughout the whole room, or they can add a touch of colour when you chose to go with a more multi-coloured variety. What is their biggest strength, however, is that the plain, understated design of hexagon tiles somehow manages to tie different types of tiles and/or patterns together as a whole. Patterns and materials that should not by all rights be able to go hand in hand somehow come together in an astonishing, seamless look if you add hexagonal tiles to the mix. It’s a miracle, and something we greatly appreciate! Whether you want to boldly go for a powerfully coloured pattern as in our example, or chose a more restrained black-and-white pattern with subtly coloured details, this kind of patterned tiles is a great way to add a special twist to your shower floor design. 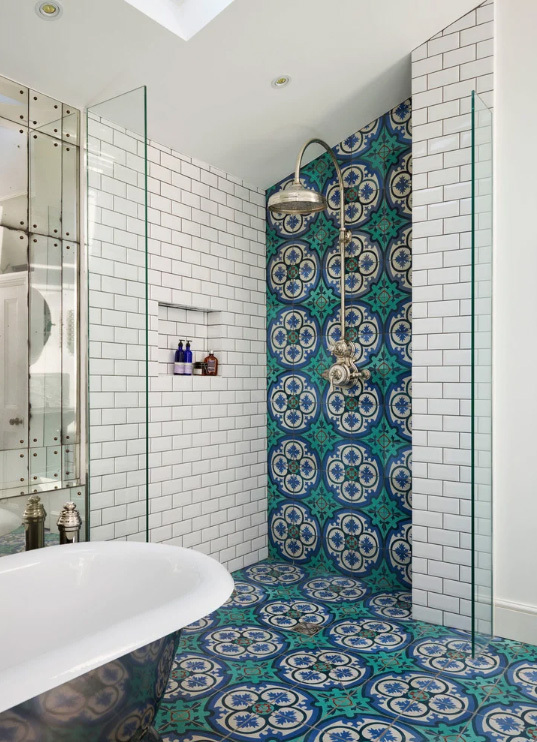 If you’re feeling particularly colourful, we suggest incorporating at least some of your chosen tiles to (parts) of your shower or bathroom wall, either in a statement block or as -for example- a border around your vanity or a handy storage niche inside your shower stall. Herringbone patterns are a quiet, unobtrusive way of adding quality, chic, and style to any room. 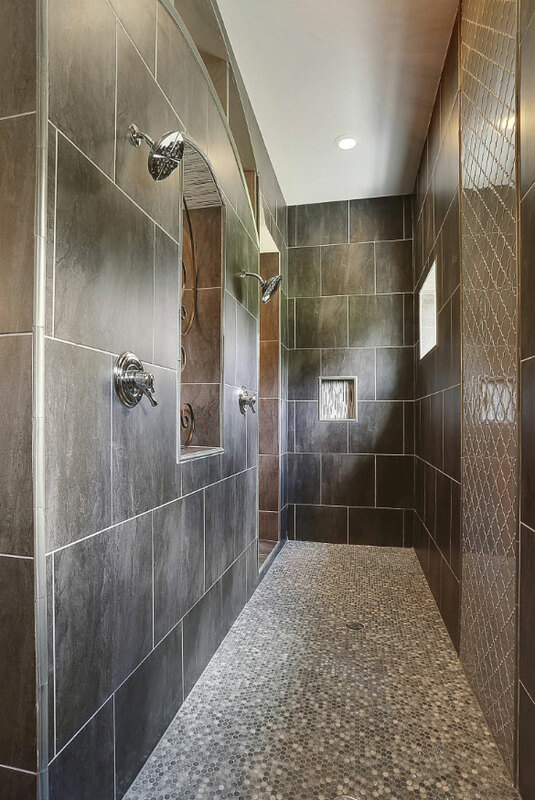 Using oblong tiles (oftentimes ceramic tiles with a wood or stone finish) to create this classic pattern in your shower adds a certain gravitas to your bathroom, but without it coming across as old-fashioned or stuffy. This kind of pattern works well with any wall (tile) design you might chose and therefore looks right at home in every bathroom. With mosaic tiles you can be as understated or colourfully creative as you feel like. Whether you chose to bring aquatic animals to life on your shower floor or go for a subtle, classic monochrome pattern, mosaic tiles are available in many different shapes, sizes, and patterns and are simply perfect to create whichever design or picture you envision in your wildest (bathroom) dreams.